My two daughters are staring, eyes wide open, bodies motionless and completely oblivious to me calling their names. The object of their fascination? A studio full of adults silently sketching in a still life art class — more precisely, the pencil outline of an apple coming to life, as drawn on an easel by a 30-something man. It is the girls’ first visit to Ray Art School, a hidden gem devoted to all things creative, discreetly located in the upper levels of an otherwise nondescript building on a busy Shibuya street. A lift carries visitors to its serene white studios that span two floors and offer a peaceful respite from the chaos of Tokyo life with a host of classes, mainly for adults (from painting to pottery). 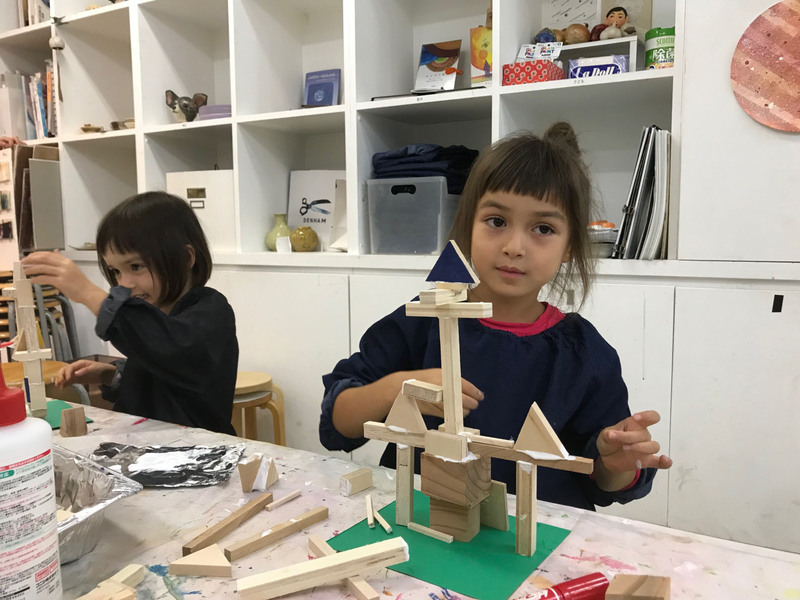 Despite its grown-up studio ambiance (the soundtrack is more likely to consist of jazz than nursery rhymes), Ray Art School also offers a comprehensive program of art classes for children — hence our recent visit. For my daughters, the idea of adults — as well as children — making and painting and drawing things is clearly mesmerizing, resulting in the endless staring when they first arrive to register. We are led upstairs to the fifth floor, where two teachers await the arrival of a half dozen well-behaved children, aged between 4 and 6, who promptly say goodbye to their parents before washing their hands, putting on denim smock aprons and sitting at a low table. The children’s class schedule regularly changes between several different themes — woodwork, painting and pottery. 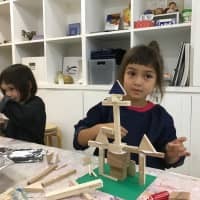 This week it’s time to play with wood and, on the table, there are piles of small wooden shapes, from oval and round to triangular and square, alongside pieces of tin foil, each with a generous squirt of white glue. Watching the class unfold, it’s clear that the teaching style is as gently creative as it is the antithesis of dogmatic: Once the pupils know what to do with the provided tools (in this instance, wood and glue), they are given pretty much free rein to create any kind of object they desire. One young boy immediately starts confidently sticking pieces together to create a stocky battalion-style structure, with complex grids of weapon-like strips of wood. In contrast, a girl sitting next to him slowly and playfully creates a delicate framework of a small house, which she proceeds to decorate with pink and orange pens before sticking on neat rows of the tiniest pieces of wood she can find. My two girls hesitate at first before slowly, but steadily, opting to build the tallest tower-like structures possible — cue regular Jenga-like tumbles that fail to deter them as they build them up again and again (using various reinforcements to make them more stable, as recommended by the teacher). The hour passes surprisingly quickly, as the children patiently add pieces and color different wooden components. Then they are each given a small blank paper flag to decorate — some choose to add rainbow scribbles, others, smiley faces — before making it the final crowning glory of each of their works. At the end of the class, hairdryers are brought out, and the kids giggle as they take turns to “blow-dry” their varied, visual creations to ensure the glue dries and holds their masterpieces together. By the time the parents arrive to pick up the kids, the teachers are already packing up the wooden creations in paper bags, with instructions to try not to touch them until the following morning when the glue is properly dried. Later, teacher Ayako Kimura explains: “Our curriculum is built around three pillars of creativity: the student’s five senses, composition and knowledge. And this mission appears to have been accomplished with my daughters. As they leave the studio, carefully clutching their paper bags, they are clearly proud of their unique wooden creations. 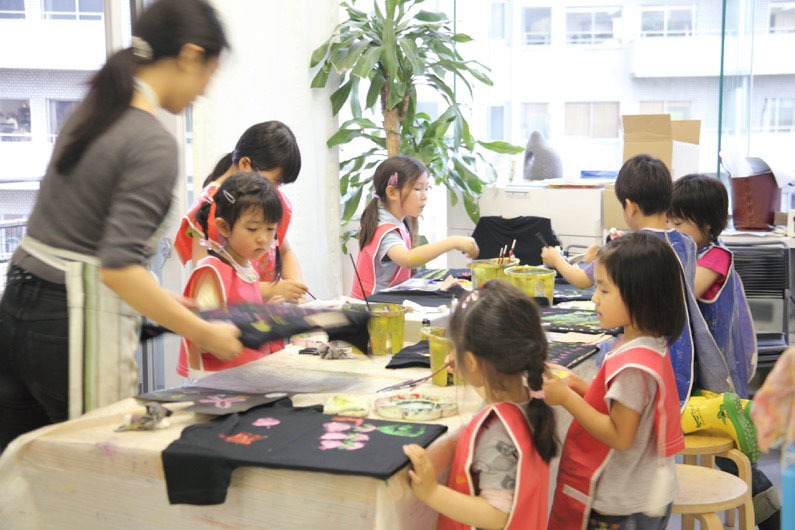 Ray Art School offers various art courses for children ranging from 3 years to high school age, mainly in Japanese. A one-off admission fee costs ¥5,400 and most classes are an hour long. 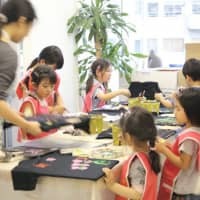 Monthly membership for four classes start from ¥12,420, depending on the age of your child and type of art class. For more information, visit www.s-rayart.com.